According to a Kuwaiti newspaper, Barack Obama has insisted that Bashar al-Assad step down as part of any international deal. 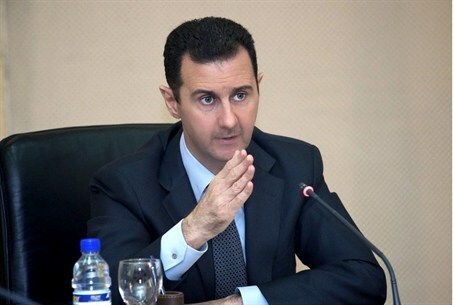 Leading Kuwaiti newspaper Alrai has reported that the U.S. administration will demand that any agreement made with Syria should commit President Bashar al-Assad to step aside, and commit the remaining parties to working towards a cease-fire agreement. Momentum towards a U.S. led strike against Syria following its suspected use of deadly sarin gas on August 21 has been stopped in its tracks by a Russian brokered deal that would see Syria hand over its chemical weapons arsenal to the international community. Reportedly, the new U.S. demand has been met with fury in Syria, where regime officials claim such a move would ride roughshod over the "democratic rights" of the Syrian people to elect their own leader. Sources close to the Syrian President were quoted as saying: "Not Iran, Russia and not the United State can decide who the Syrian President will be, " adding, "the Syrian leadership expected the demands of Washington to get bigger and bigger, but this is illegal and cannot be considered." The source added: "The intention was to enter into an agreement regarding chemical weapons that would ensure they don't fall into the wrong hands, but there will be no agreement that seeks to further strengthen the terrorist rebel forces." As talks are set to get underway in Geneva between, U.S. Secretary of State John Kerry and his Russian counterpart Sergei Lavrov, Israeli Foreign Ministry spokesman Yigal Palmor voiced his pessimism over the Russian initiative through which Syria's Assad regime could comply with chemical weapons treaties as a way of avoiding western military intervention. Palmor said that the existing 20-year-old Chemical Weapons Convention, which has been proposed as the tool for verifying Syrian compliance, has failed to attract the multilateral support that would allow it to work. Syria's neighbor Turkey has also voiced its cynicism over the diplomatic initiative. Prime Minister Tayyip Erdogan said Bashar al-Assad was buying time and should not be trusted. "We are doubtful that the promises regarding chemical weapons will be met," Erdogan said Thursday.